Activities at Chole Mjini Lodge are diverse, and you can do as much or as little as you want. 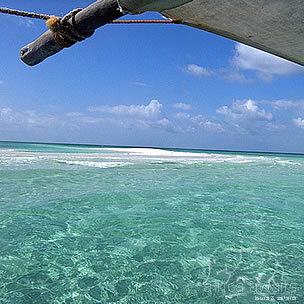 Because the Indian Ocean is only meters away, diving, snorkelling, swimming and dhow sailing are hugely popular! We own a refurbished traditional dhow that we use for full day excursions to magnificent sand banks, snorkelling trips or sunset cruises. The concept behind Chole Mjini Lodge was to build something simple yet at the same time elegant and comfortable. The goal was to create a lodge appropriate for the location, which blended in with the bush, the ruins and the mangrove forest and be open to nature but still secure and able to withstand the occasional tropical storms. In a tree house one can have privacy without having solid walls. No one can see into the houses from the ground and the absence of walls lets the Kaskazi wide pass through the houses during the warmer months. As a result we enjoy cool nights almost all year round without a/c or fans and all the houses face slightly East of North for this very reason. The communal areas of Chole Mjini Lodge are set in lush tropical gardens, which border the ruins of the old Chole Town. Six of the rooms are tree-houses, built using local techniques by expert craftsmen and set on platforms high up in giant Baobab trees, which gives breathtaking panoramic views of the Indian Ocean and lulls you to sleep with the sounds of the lapping waves. The seventh room is a ground house, which is slightly larger and caters for families with small children. 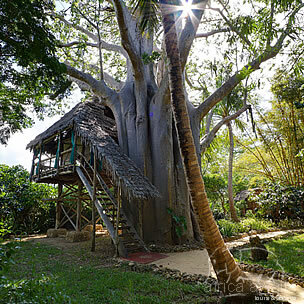 With only seven tree houses, carefully placed and designed, privacy is assured. Open to the elements, with the king-size bed the throne-like centre piece, each thatched platform is reached via sandy paths that lead through the natural vegetation. All have views of the sea; some are close enough to be lulled to sleep by the sound of the tide trickling back through the mangrove roots. Most tree houses have a second level to accommodate children. Having watched the sun set and moon rise from the rooftop bar, guests gather around a candle-lit table under the stars, either within the 19th-century ruins, the crumbling walls clasped by fig tree roots like giant fingers in the flickering candlelight, or next to the murmuring ocean. A strong Swahili influence provides delicate yet intense, flavourful spicing, and the judicious use of coconut milk. Fish and other seafood is freshly caught and delivered daily and vegetables are grown on the island. The lodge has a fine selection of wines to complement any meal. The waters around Chole Island are home to a diverse array of marine life, and whale sharks are commonly sighted, as are potato cod, giant grouper and white-tipped reef sharks. Other experiences include visiting the local village with a guide, exploring the local paths (a late-afternoon walk is often rewarded with a sighting of the local fruit bat colony in flight) or just lazing around in the sun. The protected Mafia Island Marine Park (821km²) is located between the Rufiji River Delta to the west and the open Indian ocean to the east. These two influences form one of the finest complexes of estuarine, mangrove, coral reef, and marine ecosystems in the world. The coral reefs being particularly diverse for Eastern Africa, providing a spectacular habitat for over 400 species of fish and 48 genera of hard coral - a scuba divers paradise! These unique habitats include hard coral dominated reefs, soft coral and algal dominated reefs, sheltered back reef systems, inter-tidal flats with hard and soft substrate, mangrove forests, extensive seagrass beds, algal, sponge and soft coral sub-tidal beds. The area includes critical habitat for the dugong (Dugong dugon) and sea turtles (Chelonia mydas, Eretmochelys imbricata, Lipidochelys livaceae, Dermochelys coriacea and Caretta caretta) as well as whale sharks (Rhincodon typus) and has been recognised as a critical site for biodiversity. Mafia Island is a world class diving destination. This marine park has some of the richest reefs in the World, with an unrivalled variety of hard and soft corals and tropical fish. Some commonly seen fish species include; the giant potato grouper, emperors, triggerfish, sweetlips, angelfish, barracuda, trevally, lion fish and the ever illusive seahorse. The diversity continues within the invertebrates with a huge variety of absolutely stunning nudibranchs as well as; feather stars, cleaner shrimp, numerous octopus species and coral crabs. On a larger scale often seen are also; whale sharks, eagle rays, green and hawksbill turtles, bottle nose and spinner dolphins, humpback and pilot whales and reef sharks. The diversity of animal life continues on land with; over160 species of birds including the stunning fish eagle and black kite, butterflies, reptiles, bush babies, blue duiker, sykes and vervet monkeys, wild pigs and the rare Comores flying foxes. 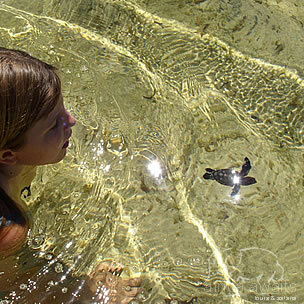 Green and Hawksbill turtles lay their eggs on some of Mafia’s remoter beaches. Chole Mjini Lodge partners with both the Sea Point Dive Centre and Big Blu, located across the small channel at Utende, to offer the best and safest diving to our guests. These dive centres offer day, night and double dives along with all PADI courses from novice to Divemaster level, in safety and in respect of the environment of this beautiful island. To organise any of the following services please let us know at least a day before and we will look after your diving requirements. If you need any equipment we can assist you for fitting at the Dive Centre and from then on they will collect you from the Red Herring at a designated time. With your holiday, safari or business trip from in to Chole Mjini Lodge in Tanzania.